We’ve been pleased to have Kansas City-based SocialVolt as a new Social: IRL sponsor for 2012. They have been a great partner, already participating in Social: IRL events in Wichita and Kansas City, co-hosting a webcast with the American Marketing Association, and providing guests posts for the Social: IRL blog. 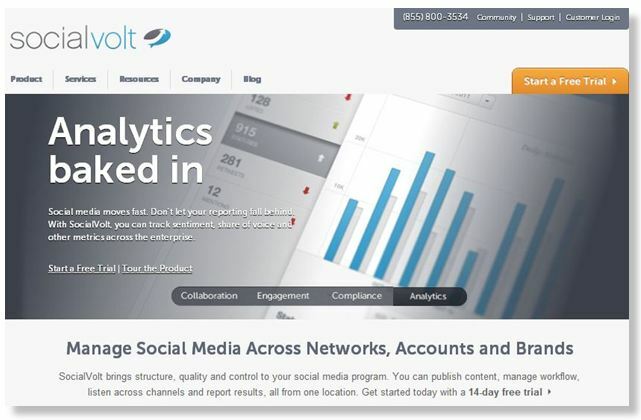 SocialVolt delivers enterprise social media management solutions for businesses and agencies. Its unified platform supports engagement across brands, while delivering accurate reporting from multiple channels. With SocialVolt, companies maintain control, minimize risk and empower staff at all levels to build profitable customer relationships in real-time. Check out SocialVolt’s blog and new website for more details, and connect with them on Twitter and Facebook. SocialVolt brings structure, quality and control to your social media programs. You can publish content, manage workflow, listen across channels and report results all from one platform – so you can spend less time juggling tools and more time driving your company’s social media strategy. With SocialVolt, you can manage social media across the enterprise, from marketing and customer support to sales and product development. Users can maintain control, minimize risk and empower staff at all levels while listening to and engaging in social media conversations across multiple brands. Ideal for heavily regulated industries, SocialVolt bakes compliance and risk management into your social media program with detailed audit trails, prohibited terms, custom review dictionaries, approval workflow and access controls. You can securely enable staff and volunteers to spread the word through social media without giving up control of your brand identity while ensuring compliance with corporate standards and industry regulations. SocialVolt is also ideal for agencies looking for a turnkey, centralized solution to manage social media engagement, listening, reporting and compliance across multiple clients and brands. Social: IRL is now pleased to help SocialVolt announce their new Channels tool. Announced on February 22, SocialVolt Channels monitors Facebook, Google+, Twitter, YouTube and millions of blogs for brand conversations. Using Channels, users can create unique listening agents by setting tags to follow conversations about their brands and competitors, while tracking their share of voice in social media. Channels also includes a new sentiment engine. Based on a series of scientific algorithms, all posts are immediately classified as positive, neutral or negative, allowing users to gauge brand sentiment in real-time. You can learn more about the new Channels tool in SocialVolt’s official press release and in these posts published today by Forbes and AllFacebook. The SocialVolt platform is available in the following editions: Team, Business, Professional and Enterprise. Visit http://www.socialvolt.com/product for more product details, pricing and a free-trial.